The Dolphin Trainer For A Day experience is based at the Mirage Hotel in Las Vegas as part of Siegfried & Roy’s Secret Garden at the rear of the hotel. It’s really expensive but that’s because it’s a once in a lifetime opportunity and I’m really glad I did it. I just needed to get all my relatives to pay for it! My partner paid to be an observer. The observers follow you everywhere and see everything you do, eat everything you do, but don’t get in the water with the Dolphins and don’t get to interact with them. The day starts with a bit of an induction, you’re taken a tour of the facility and told a little of its history – the focus is very much on study and conservation, this is not somewhere to go to see Dolphins do tricks and shows. After that you get breakfast where there is so much food to choose from it’s ridiculous. The only thing I would say is that the day would have benefited from breakfast first, we were really hungry when we got there and it would also have meant more of a break between then and lunch. After breakfast it’s wetsuit time. I’m a really small person but have the body of an adult. In the past I’ve been handed children’s wetsuits which have been impractical and uncomfortable – not here, they took all my measurements well in advance and I had a lovely comfy suit to wear throughout the day. If you’re not mega confident in the water either don’t worry – the suits act as buoyancy aids, I have no idea how but you can just bob there in the water without having to tread water or swim. The rest of the day you basically shadow the trainers, are taught the commands they use with the Dolphins and basically interact with them. It’s magical! 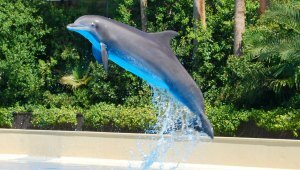 Dolphins are very intelligent animals that need stimulus, you’re the stimulus. There’s a break for lunch where you’re presented with a three course dinner – again LOADS of food. Throughout the day a photographer is constantly taking pictures. At the end of the day you’re presented with a photo Cd of your day, a print of you and a Dolphin, t shirt and baseball cap. Did I have a wonderful time? Definitely. Would I recommend it? Yes, but save up your pennies, it’s pricey. Tickets typically range from $495 to $595 depending on the time of year (2014 prices).